One of the main goals of being an educator is to help students advance their knowledge and prepare for their future careers. A key aspect of delivering on that mission is to adopt and embrace the technological tools that can facilitate how students learn. But as more students have their own palm-sized devices that can be easily transported to school, bring-your-own-device, or BYOD, programs have become a reality for many schools. The introduction of BYOD programs brings a number of opportunities to transform how students learn. With smartphones or tablets, learning becomes more interactive and engaging – from going on virtual field trips without leaving their desks and interacting with other students and teachers around the world, to giving students more authority over their own learning, the possibilities are endless. BYOD also enables them to leverage new education materials like eBooks, digital text books, video and gamification, giving them anytime, anywhere access to the latest information. In addition, BYOD allows educators to deliver more personalized instruction, while helping students learn at their own pace. Despite these benefits, however, there are some concerns about implementing BYOD programs in schools and districts. From the tactical aspects of managing a wireless network in which each student has a device, to understanding how to optimize student learning across different devices and operating systems, there are indeed some questions school and district administrators will want to ask before implementing such a program. 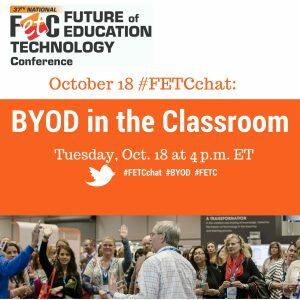 As more schools and districts seek to implement BYOD – and want as much information as possible to ensure they get it right – the Future of Education Technology Conference (FETC) is pleased to host a live Twitter chat on this crucial topic on Tuesday, October 18, 2016 for 4–5 p.m. EDT. The chat will address all aspects of BYOD programs in the classroom, so be prepared to ask any questions and learn from one of the most prominent thought leaders in the space about how you can implement BYOD successfully. And if you want to learn more about BYOD, make sure to register for the FETC event, taking place in Orlando January 24-27, 2017. The conference will offer many hands-on workshops and informative sessions dedicated to the topic of BYOD and how it can truly elevate the learning experience. For a complete list of workshops and sessions at FETC 2017 visit www.FETC.org.